Home » F.A.Q.s » Do you have J-clips? 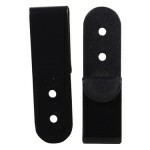 Do you have or can you get J-clips because I do not want people to see the clips over my belt? This is a question that gets asked often so I figured I would address it here. 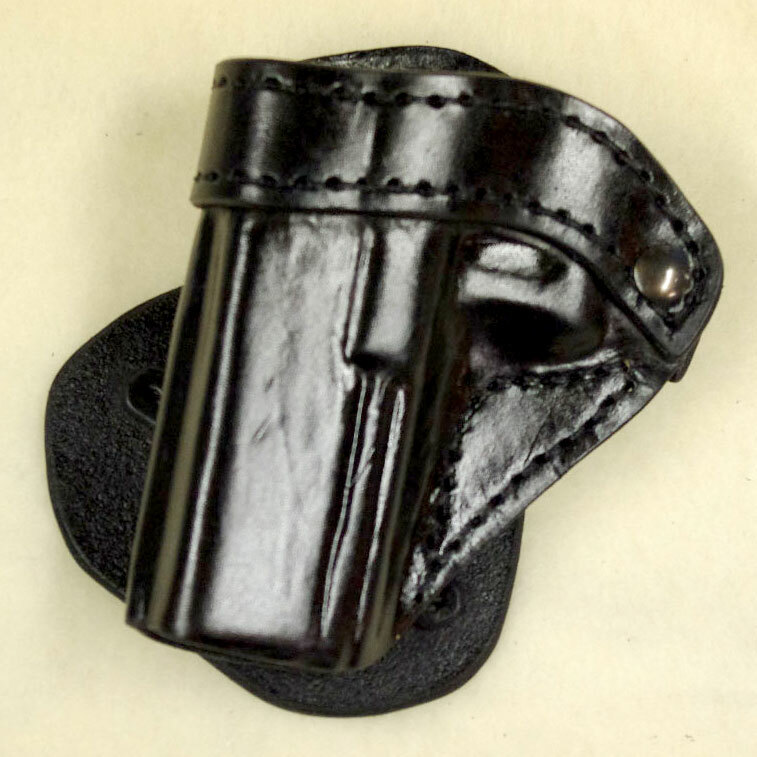 A J-clip is just a belt clip that is to weak to hold to the pants and that is the reason for the need to put the extra bend in the clip so it will catch the belt when you draw the pistol. The clips I use are very stiff and hold tightly, therefor you can clip them just over the pants and put the belt over the clip. 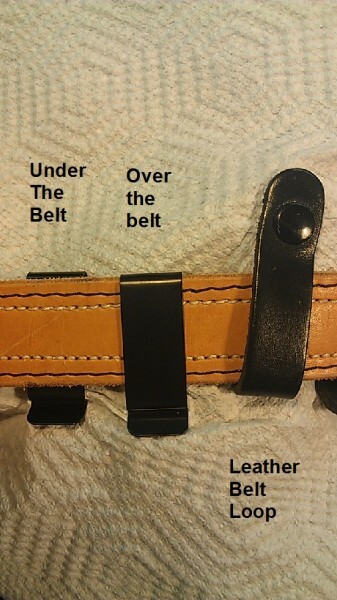 This takes care of the concern of having a clip over the belt. 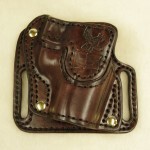 The Invisi-Tuck has such a smooth draw and the clips are tight enough that the holster will not move when you draw your gun. I have been asked to make Leather Snap loops and make them tuckable this is why I also provided a picture of the leather loop to show what a bad idea that would be. There is one problem with any clip that is put over just the pants and not over a belt as well. 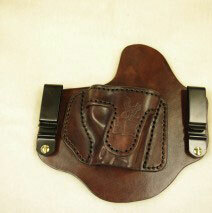 The material of the pants will sag at that point because the fabric can not support the weight of the pistol. So At this point I only offer the one style clip because it has proven it self to be effective and preforms extremely well under so many conditions. Comfortable all day OWB wear. High and tight to the waist. 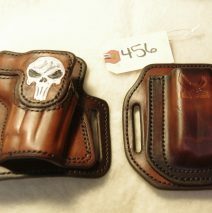 Custom Requests: Call or email. 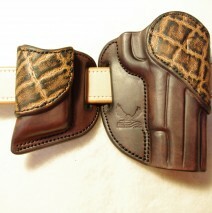 Leather High Ride holster and mag set for a Sig P228, right-handed, with skull tooling, is ready and available for prompt Shipping. 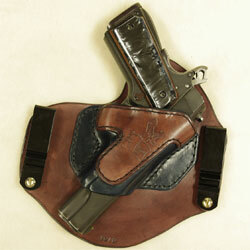 The order process with American Holster Company. 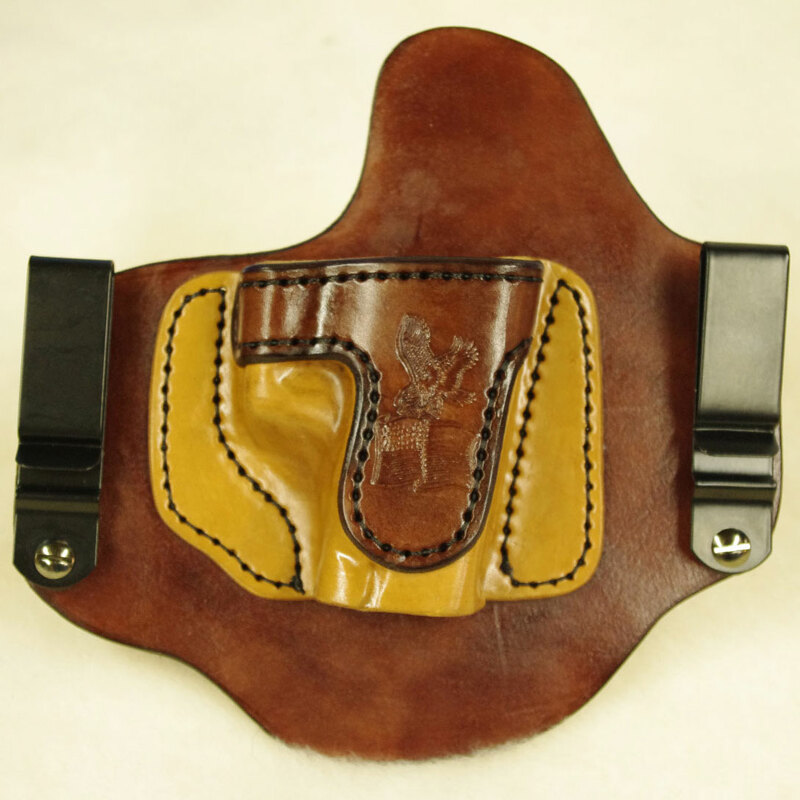 Because we are a custom shop and make one holster at a time it is important that the communication between you and American Holster Company be timely.